The ultimate anti-ageing collagen drink that really gives results. - Delay the early signs of ageing. - Nourish your skin from the inside out. 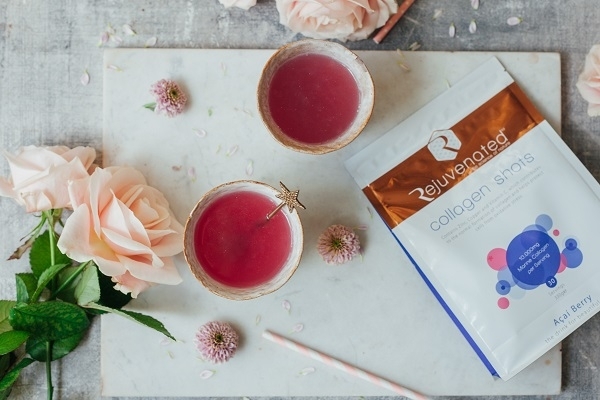 Discover the benefits of drinking collagen for radiant skin. High strength award winning Collagen Shots drink with skin firming antioxidants and vitamins. 10,000 mgs hydrolysed marine collagen, hyaluronic acid, acai berry super antioxidant, combined with vitamin B3, B5, C with zinc and copper. 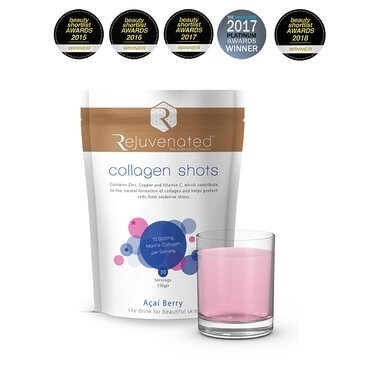 Rejuvenated’s ‘Collagen Shots’ provides you with 10,000mgs of marine extract collagen – that’s equal to between 20 to 30 typical collagen tablets a day! The fruit flavored drink consists of 100% natural marine collagen and acai berry which helps reduce premature ageing for just £1 a day! After the age of 25, the body begins to lose its ability to create new collagen, reducing by 1.5% a year and by the age of 45 collagen levels can have reduced by as much as 30%. The visible effects of this collagen reduction are the appearance of wrinkles, fine lines and dry skin, which we know too well are associated directly with ageing. With statistics like this, it's no wonder an anti-aging system can't be effective without an adequate supply of collagen! True skin health starts deep within and supplementing collagen levels with Collagen Shots will improve elasticity and help to give a more youthful appearance. 10,000 mgs marine collagen, hyaluronic acid, acai berry super antioxidant, combined with vitamin B3, B5, C with zinc and copper. • Delay the early signs of ageing. • Nourish your skin from the inside out. Comes in a 30 serving pouch or 24 individual sachets. Do not drink if you are allergic to fish or shell fish. If you are pregnant or breastfeeding take advice from your doctor or healthcare practitioner before taking. The Sun - £1-a-shot drink that banishes wrinkles! "The best Collagen Powder" Women's Health "The best collagen-boosting supplement" - Sheerluxe "One of my favourites is Collagen Shots by Rejuvenated" - Beauty Shortlist "If you're looking to feed your skin from within, then this is a good bet"
Marine Collagen Hydrolysate, Acai Berry extract, ascorbic acid (vitamin c), hyaluronic acid, Flavouring, Niacinamide (vitamin B3), Calcium Pantothenate (vitamin B5), Pyridoxine Hydrochloride (Vitamin B6), natural sweetener (Stevia), wild berry flavouring.